Chlorine dioxide generator is designed to produce and consistently maintain a product yield greater than 90%, which makes it ideal for drinking water treatment. It is a two-chemical system, utilizing commercially available concentrations of hydrochloric acid and sodium chlorite in the production of chlorine dioxide. No chlorine gas is required. A proven design, durable construction and the use of the best available corrosion-resistant materials assure efficient gas production, precise solution feeding, low maintenance and dependable operation for the life of the equipment. It is available for either manual or automatic control. 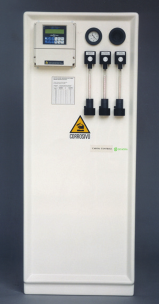 Chlorine dioxide gas production can be manually controlled by manual rate valves located on the cabinet face or automatically controlled by a Chloromatic™ valve, which accepts a 4-20 mAdc input control signal from a flow transmitter or a residual controller .